At BannerBuzz, our vinyl banner printing service offers a variety of custom banners to anyone. If you're a new business in the neighbourhood, we have you covered. If you're a mother planning a Sweet Sixteen birthday, that's okay too. 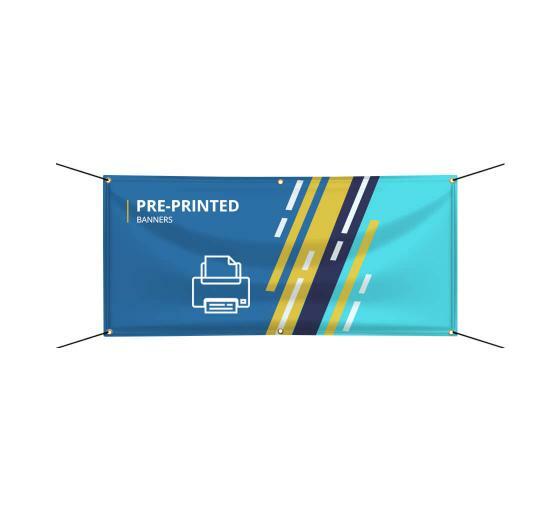 With our vinyl banner printing service, our large inventory makes it easy for you to find every type of banner you'll need to get an event moving-after all, time is money! We have "for sale", "now hiring", and other vinyl, large printed banners in a variety sizes to suit your business' needs. Because each of these pre-printed banners are made with weather-resistant vinyl, they are made to last at least six to seven years indoors or outdoors. Hang these up at the storefront, sides of buildings or walls. Because these are pre-printed, all the work is already completed. So start drawing customers toward your business today and do your vinyl banner printing with BannerBuzz! When placed in highly visible locations, vinyl pre-printed banners have the potential to increase foot traffic. All it takes is a little guidance. Our pre-printed banners can help customers know if the business is open and what types of goods or services are offered at the establishment. Because BannerBuzz has such a large selection, prices stay low despite our use of high-quality, vinyl banner printing equipment. We will make sure to get you exactly what you want pick and click as you please. Don't forget to find out if your order qualified for free shipping.